The 2017 Laurence Xu Haute Couture Show, an event highlighting the work of the world-renowned fashion designer, was held in the ballroom at the InterContinental Paris Le Grand last July 4, 2017, during Paris Couture Week Fall/Winter 2017. The uniforms that were showcased combine elements of classical, time-honored Oriental aesthetics and the silhouette of a modern Western suit, infusing new vigor and fashion into the attire. The fifth-generation uniforms highlight the combination of traditional Chinese features and internationally popular elements. 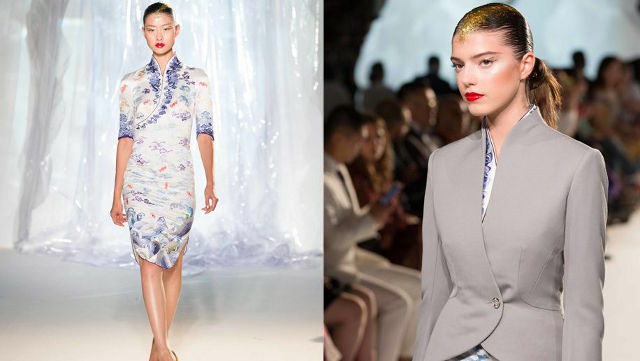 Repurposing the alluring look of the Cheongsam, a stylish traditional Chinese dress for women usually worn on more formal occasions, the uniforms feature a collar overlaid with a pattern of auspicious clouds and a lower hem with a pattern alternating sea and mountains which contrasts with the collar's clouds and sky, drawing a comparison between a Hainan aircraft that has just taken off, and the roc, a mythical bird denoting strength, as it lifts into flight. The 3/4 sleeves denote simplicity and just the right amount of modesty, symbolic of the cabin crew's high level of competence. The apron is designed like a tulip-shaped dress to emphasize, in equal measure, elegance, femininity, aesthetics and practicality. The Western-style draping incorporates popular international fashion elements alongside a sense of high-quality professionalism. 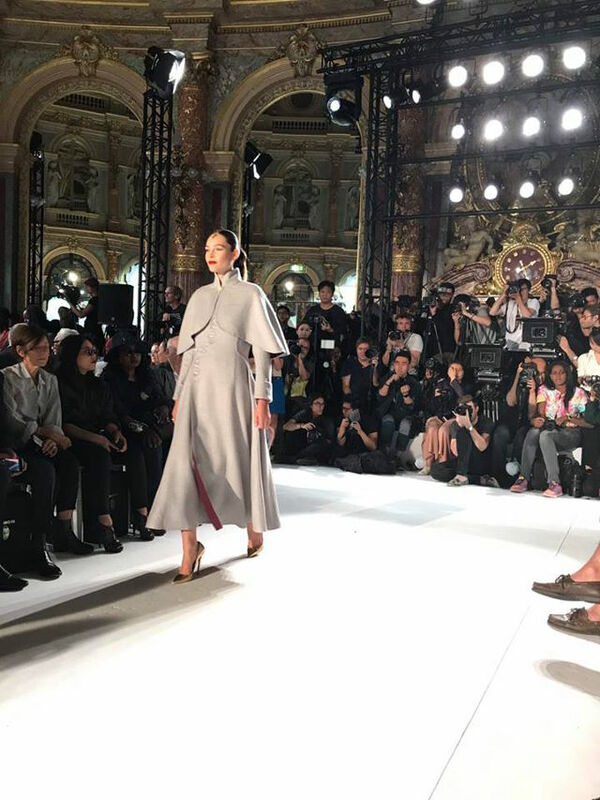 The fusion of traditional Chinese elements and popular international fashion created an Oriental masterpiece that turned heads in Paris. The new attire maintains and adds a new twist to the previous generations' iconic elements - the Oriental art-inspired patterns and gray-color theme that have always been an essential part of the uniform's design. The uniform pays a tribute to the designs of the previous generations, cleverly updated with a modern aesthetic that incorporates popular international fashion elements. The fourth-generation uniforms have been in use for seven years starting from 2010. 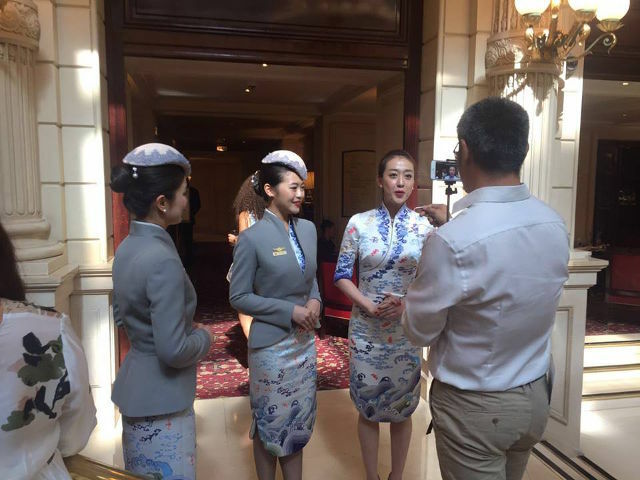 Driven by Hainan Airlines' strategic vision of becoming one of the world's most prominent carriers, two years ago, the airline opened a discussion with Laurence Xu that led ultimately to the creation of the new uniforms. 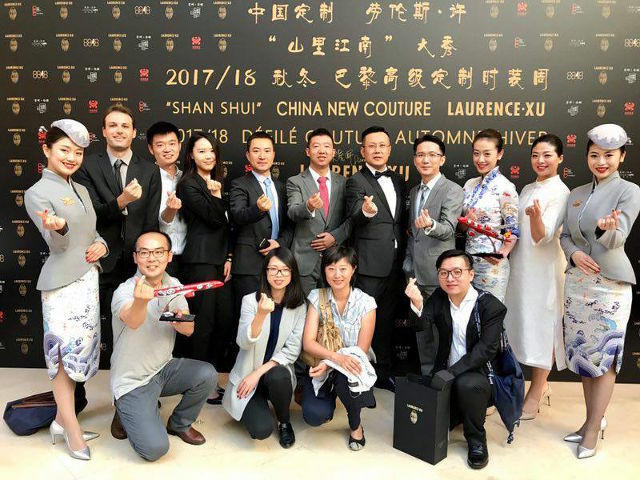 During the design process, Hainan Airlines and Laurence Xu met and talked frequently, going through more than 1,000 design blueprints and trying out more than one hundred samples of garments and accessories. The debut of the new uniforms at this year's fall/winter session is not only the result of a combination of fashion with aviation, but also a cross-industry cooperation in terms of travel and fashion and a testament to Hainan Airlines' ingenuity. 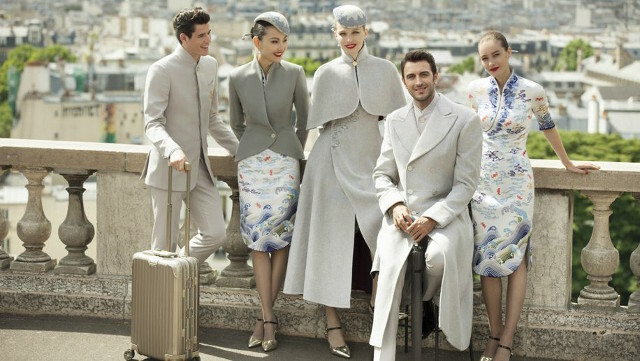 The uniforms are now an element of the masterful visual experience that has become part and parcel of what the airline's domestic and international passengers are treated to when they fly with Hainan. The ingenuity that led to the cross-industry partnership is just one component of the commitment that the airline has made in terms of catering to ever-changing passenger expectations. Another example of how that ingenuity played a role is when Hainan Airlines partnered with renowned international pianist Lang Lang in 2016, which culminated in the famous performer playing piano for passengers "in the clouds" on Hainan Airline flight. As for ground services, renowned designer Dr. Patrick Leung, at the invitation of the airline, designed its international VIP lounge, the HNA Club, which provides business class and club member passengers with a comfortable environment amid multifunctional facilities. With a lasting focus on details and a continued commitment to innovation, originality and keeping ahead of passenger expectations, the airline has been providing travelers with the highest quality services over its 24 years of existence. Who wants to be a flight attendant for Hainan Airlines? This fashion line is super cute to me. My favorite piece would have to be the long overcoat. I am drawn to the light gray color used as well. Wearing these kind of uniform as a flight attendant is very motivational. Very Cool ..Doesn't even look like a Uniform at all ! Exactly Chandresh. Very chic and stylish! What does an American Airlines uniform looked like? These new uniforms look beautiful! They're so elegant and classic, but also modern. I agree. And they look so respectful. Ahh a good uniform will give you something, awesome. Wow, those are some nice outfits for flight attendants. Most of the time they look rather drab. Yeah, but at China Airlines it is fabulous! Boy those are the best dressed flight attendants I've ever seen. I wish I could buy that one-button jacket! Isn't it nice to fly with these flight attendants? More motivation to fly and to apply at China Air! So many changes have been made to several airlines throughout this year. I guess it's just a season for change. I must admit that I am enjoying seeing all the new styles that are being designed. At least no more boring flight attendant uniforms. But hey this is only for China Airlines. Another flight attendant I like is the one from Singapore Airlines and Thai Airways. You see, Asian airlines know it right. Umm can I wear their uniforms? LOL! If they spending this kind of time, detail, and consideration given previous generations, then I am sure the flights are impeccable. I have never heard about Hainan Airline before so I do not know their uniforms that they used to have. But I must say that these are stunning. It is a national airline from China. And knowing China, they always make it grand. These uniforms are super stylish. Wow! I wish I could even fly on this airline just to see it up close. Thanks for sharing. LOL! I would love to work for Hainan, but I can's speak the languages required. Since they fly to Calgary, it would be an excellent job. The uniform looks very attractive to me. If you can speak fluent English then you can. Learning Mandarin is part of the training. Wow those are some seriously modern styles! I actually really like them, they're definitely going to be trendsetting. Thank you Zakari. I bet their job application rise up because of their newest uniform. These are some beautiful uniforms. I love when flight attendant uniforms are cute, it makes the flight more appealing. I want to fly this airline now. Such beautiful uniforms. Taking their flight will be such a joy. The blazers don't look Oriental at all, though. Exactly, I guess they will feel more proud and happy as flight attendants.